This semester I’m taking a class that covers service design related to food systems. We’re working with a major regional food bank to do some participatory research and design with community members. Last week, I dug into the topic of food pantries and did a bit of research on what it takes to use one. I found that, on paper at least, it’s a challenge to find one thats a.) nearby b.) open at a time you’re available c.) takes walk-ins. You need to have about as much documentation to use a food pantry as you do at the DMV. Sometimes there are other qualifications, too. This diagram is really abstract. 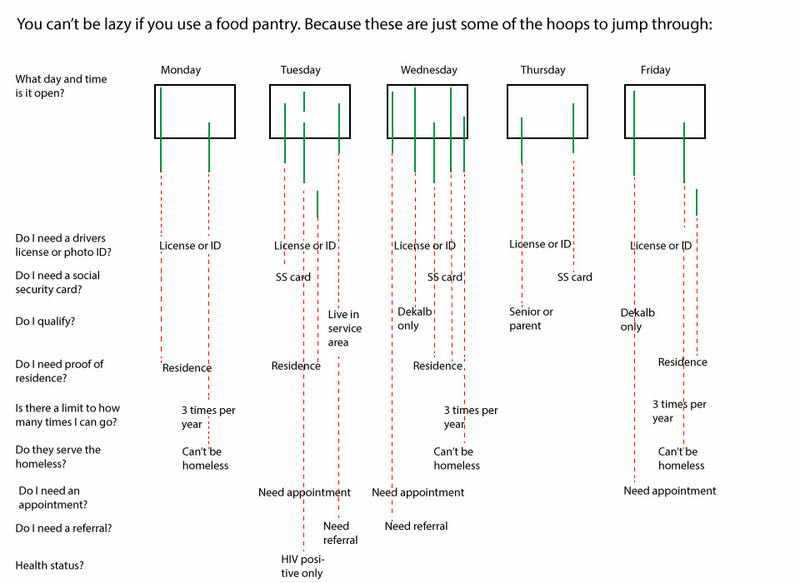 I simply compiled all the various requirements and hours of the 10 closest food pantries (in the neighborhood we’re working with) and tried to diagram each one with a vertical line. Each green line is an approximation of the time the pantry is open (and yes, that’s usually just a few hours once per week). The dotted red lines lead down to the potential road blocks a user might encounter when trying to access services (i.e. not having proof of residence or needing a referral). It might be interesting to build this out in a more specific way. Since I made this in just an hour or two, it’s more of a first draft, but I’d be interested in digging deeper into this issue with more data and a different take on a visualization.